The power of taking a hike. 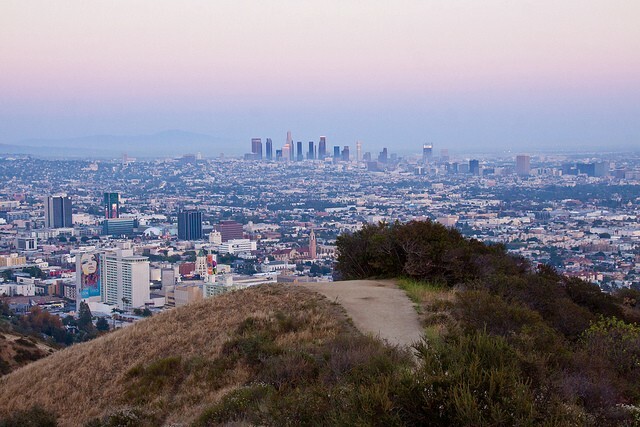 When I was living in Los Angeles, I discovered that I came up with many of my best ideas while I was hiking. And whenever I could, I would schedule hikes instead of sit-down meetings, with both my friends and HuffPost editors. How many times have you experienced a sense of joy in a stale conference room while half listening to an endless PowerPoint presentation? Between our minds and our legs, one of them is going to wander. Sit still and our minds want to ramble. Get up and start walking, and our minds can slow down and be more focused. One of my favorite phrases is solvitur ambulando — “It is solved by walking.” It refers to the fourth- century- BC Greek philosopher Diogenes’s response to the question of whether motion is real. To answer, he got up and walked. As it turns out, there are many problems for which walking is the solution. In our culture of overwork, burnout, and exhaustion, how do we tap into our creativity, our wisdom, our capacity for wonder? Solvitur ambulando. A lot of the planning for The Huffington Post was done on hikes. Our first investor, Laurie David, decided to invest after I pitched her the idea on a hike. Our founding arts editor, Kimberly Brooks, pitched me the idea of an arts section on a hike. Walking was also really important when I went into labor. Indeed, doctors are discovering that keeping women in bed for hours while they’re in labor is one of the worst ways to facilitate the baby coming through the birth canal. Even though I was scheduled to give birth at the UCLA Medical Center, I spent most of my labor walking with my midwife around the grounds of the nearby hotel where we were staying. By some strange coincidence, that was the day that the sale of the hotel to new Japanese owners had been announced. So my strolls — around the grounds, past the herb garden, across the grass, and back to the lobby — were punctuated by the stares of worried disbelief from tourists, Japanese cameramen, and a couple of local television crews, as well as by my occasional sharp contraction– induced gasps and my midwife’s confident words of support. When the midwife estimated I was within an hour of delivering, we piled into the car — by then my mother and sister had joined us — and off we went to the hospital. Thirty minutes later Christina was born. Over the years, I came to realize that a journey that is full of adventure and discovery doesn’t have to involve planes and cars and passports. The benefits of a journey are available simply by walking. Now that I live in Manhattan, I walk all the time, both to get from place to place and to catch up with friends instead of having breakfast or lunch meetings. Scientific studies increasingly show the psychological benefits of walking and other forms of exercise. “It’s become clear that this is a good intervention, particularly for mild to moderate depression,” said Jasper Smits, a psychologist at Southern Methodist University. The results are so clear- cut that Smits and a colleague have written a guidebook for mental health professionals with advice on how to actually prescribe exercise for patients. And, surprise, there is no page- long list of dangerous side effects accompanying this prescription. In the United Kingdom, in a series of studies at the University of Essex, researchers found that 94 percent of those who took part — walking, running, cycling, gardening — saw mental health benefits. Walking as a tool for dealing with depression is no small thing when you consider that, according to the World Health Organization, more than 350 million people worldwide suffer from depression. Research has shown similar benefits from simply being outdoors and surrounded by nature, which has “implications not only for city planning but also for indoor design and architecture,” according to Richard Ryan of the University of Rochester Medical Center. He coauthored a study showing that spending time in natural settings makes us more generous and more community oriented. Another study, this one by Dutch researchers, shows that those who live within one kilometer of a park or wooded area suffer lower rates of depression and anxiety than those who don’t. But even if we don’t live surrounded by trees and greenery, we can always take a walk through them. On the flip side, it turns out that sitting is as bad for us as walking is good for us. According to an American Cancer Society study, people with a sitting job are more likely to develop cardiovascular disease than those with standing jobs. This is not a new discovery. A 1950s study of people in similar lines of work showed London bus drivers had a higher incidence of death from cardiovascular disease than bus conductors, and government clerks had a higher incidence than postal workers. The benefits of getting up and walking — of moving — go beyond our bodies. A study led by University of Illinois researchers shows that walking three times a week for forty minutes at one’s own natural pace helps combat the effects of aging and increases brain connectivity and cognitive performance. So it’s not just ruminative, creative thinking that’s enhanced by walking — our focused, get- things- done type of thinking is improved, as well. Perhaps in addition to walking meetings we should consider creating walking classrooms. This touches on a concept critical in the Japanese aesthetic, including the traditional tea ceremony — the concept of Ma, which can be loosely translated as the essential space, or interval, or gap between things, and the importance of creating and fully experiencing such spaces. So whether we are just “taking a walk” without wanting to get anywhere in particular, or whether we are walking toward a destination, walking to connect two places, the space, the interval in between, can be important. It can, in fact, be the point. “Shake off the village” — what a perfect way of conveying a vitally important and universal human need. Since Thoreau’s time, the village has grown exponentially bigger and become more intrusive and seemingly more intimate — giving us the semblance of human connection without any of the real benefits of that connection. Technology has enabled the village to become exceptionally good at not allowing us to shake it off. With the advent of the smartphone, getting away from it all is no longer as easy as simply getting up and walking away. Increasingly, we don’t even try to shake off the village. We surrender to a life of distractions, living, as Thoreau put it, much of our lives out of our senses. We walk the city texting and talking and listening to music on our smartphones, disconnected from those around us and from ourselves. Journalist Wayne Curtis calls these hyperconnected individuals “the digital dead, shuffling slowly, their eyes affixed to a small screen in their hands.” He cites a University of Washington study that focused on a single intersection in Seattle. The study found that one in three pedestrians was distracted while crossing the street, and in the vast majority of cases, they were distracted by either listening to music or typing or talking on a phone. And, not surprisingly, it took those who were texting almost 20 percent longer to cross the street. Another study found that those texting were 33 percent slower getting to a planned destination. As Guardian columnist Oliver Burkeman wrote, “Smartphones have been ubiquitous for years, of course — but much more recently, there seems to have been a shift in social norms. For many people, the unwritten rules of sidewalk choreography now include this: If what I’m reading or watching on my phone is suffi ciently interesting to me, it’s entirely up to you to get out of my way, just as if I were very frail, or three years old, or blind. Or a lamppost.” It can be a dangerous habit. In December 2013, a tourist in Melbourne fell off a pier and plunged into the sea while checking Facebook on her phone. She still had it in her hand when she was rescued. And she was one of the lucky ones. According to an Ohio State University study, in 2010 more than 1,500 pedestrians were admitted to emergency rooms as a result of accidents involving cell phones or other mobile devices. In trying to lessen the hold of technology on our lives, we need all the help we can get. Some of us are able to switch our devices on and off, go cold turkey for periods of time, or go on periodic digital diets. But not all of us have that kind of willpower. Walking — without our devices, or with our devices turned off — is a start. So, please, walk. It makes us healthier, it enhances cognitive performance, from creativity to planning and scheduling, and it helps us to reconnect with our environment, ourselves, and those around us.